Cavaliers triumph at ?Red River Thunder? showdown! July 26, 2010 — Denton, TX . . . Thunderstorms loomed, but to no avail as the 5th Annual ?Red River Thunder? was presented by The Cavaliers and the Ryan High School Band Boosters. The storm front provided cooler weather for appreciative fans. The C.H. Collins Athletic Complex is a fantastic venue for drum corps. Plenty of good seats, lots of parking and ample warm-up areas. The Vigilantes were the first corps out of the gate, performing their very first field show of the season. 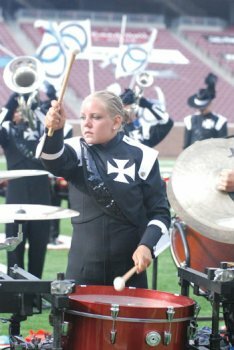 The all-age corps has plenty of talent in the ranks, despite its small size. Brass primarily carries the corps since battery consists of only two snares and two basses. Word on the street is that this deficiency will be remedied soon! The corps offers up a decent concept, attempting intricate drill patterns, solid solos and good volume. Their music is easily recognizable and, with continued exposure and cleaning, should improve dramatically. Music City presented their ?Rivers Sounds? program as the first corps in Open Class. The theme takes the audience on a southern-flavored ride of Old Man River, I Can?t Help Falling In Love and When The Saints Go Marching In. The arrangements were clever, mimicking Southern music groups and genres. The corps appeared to enjoy performing and scored first in GE Music and second in Brass and Percussion. Forté was next in Open Class, performing their ?Stargazing? show. The corps is off to a good start with a strong horn line and repertoire, familiar to fans. Percussion was a bit dirty at times, especially during flam accents and releases. The demanding drill may be the problem. The final push is a fast groove in three and recaps with Jupiter from ?The Planets? for a definitive end statement. Due to the extensive repertoire, the show feels disjointed at times. This program should meld as transitions are solidified. The Velvet Knights presented their ?Magical Mystery Tour? show. It was a pleasure to see this much loved corps in the lineup. The show exuded good energy tonight, with audience-friendly music and lots of good fun. The corps? main challenge generally seems to be cleanliness. There were good guard moments and good drill throughout, but lots of work still remains. Success this season will depend on how well the corps tightens up phrasing, execution and tonality. Revolution placed first in nearly all captions for the Open Class title. Their ?Fade to Black? show makes good use of the field and delivered consistent volume. The ballad offered a nice arc formation upfront that transitioned to a cluster of contras. The guard seemed to have silk work challenges tonight. A nicely executed fadeaway drill to backfield ended the program that sealed the deal for first place. The Crossmen opened the World Class competition with their ?Full Circle? program. Snare-mounted accessories are common. However, I can?t recall ever seeing castanets. The snares did a good job of tapping out rhythms and cutting through the music with them. Volume tonight was especially high during Heat of the Day. The follow-me drill was effective and circle formations drove home the theme. The guard had a few moments where flag spins just didn?t sync up. The show had ?in your face? moments, with long sustaining chords, to the audience?s delight. The Madison Scouts were on fire and easily won the ?fan favorite? award. Slaughter on Tenth Avenue began with a loud introductory chord culminating into an old-school company front. The end note absolutely tore the house down! There were moments of high leg lift marching (a trend this year) and a beautifully executed solo in Rhapsody In Blue. Fans were treated to outrageous shenanigans by the guard. The ballad was brought home with an upfront kneel down that was absolutely gorgeous to listen to. This was an enjoyable performance, showing Madison is about tradition as well as excitement! The Blue Stars were a big surprise tonight. Their ?Houdini? program earned fourth and was a visual and musical delight, setting a high bar for the corps that followed. The show offered a mysterioso theme, complete with soaring mid-horn phrases, blazing drum features and a guard displaying wonderful story-telling. The corps is establishing itself as a serious competitor this year. The drill is outlined with wooden boxes used to emulate Houdini?s great escapes. The brass had good control of difficult passages thanks to fresh arrangements. The show ended with the entire corps dropping on their backs after a strong finale. Carolina Crown?s ?A Second Chance? show is aptly named as the corps earned second place tonight. If there were a pre-show ?warm-up? caption, the corps would have have won it. The drill is an exciting presentation of innovative visuals, intricate formations and ominous company fronts. The corps is having fun with this program and at times the difficult drill appeared to have a Cadets/Cavaliers influence. This was evidenced when the brass straddled the 50-yard line with horns down the middle of the field. The brass-colored horns this year really stand out in contrast to the silver horn lines. It will be interesting to see how far Carolina takes this show in Indianapolis. One thing is certain, they will leave an indelible impression this season. The Cadets performed next, placing third with their ?Toy Souldier? program. This show was a real crowd-pleaser as the story unfolded about a child interacting with toy soldiers. A few young giggles were heard from the audience when Lil? Jeffrey placed a large metal key on a horn player to wind him up. The percussion was crisp and clean, narrowly losing to Carolina by 0.1. Brass placed second with an unbelievable book of sixteenth-note runs played while executing mesmerizing drill moves. The guard wore the traditional corps uniform to assist in a larger body count of soldiers. Eventually they shed the jacket, allowing more freedom of movement. Overall, a fantastic performance presented to an always appreciative and enthusiastic fan base. The Cavaliers took top the top honors tonight with their ?Mad World? program. There was an abundance of testosterone on the field from the all-male corps as it began. They placed first in all captions except brass, which had difficulty with execution. The show haunts and taunts as it portrayed the psychosomatic effects attributed to military stress, war, death and the fragility of life. There were poignant moments conveying respect for life and the consequences of our choices. The ?push up? segment was an instant hit with female fans! The concept may not be easily understood by the average fan expecting ?vanilla? entertainment. However, it was evident the crowd respected the corps? performance based on solid execution, inventive drill patterns and originality. Congratulations to The Cavaliers and the Ryan HS Band Boosters for taking a leap of faith five years ago. I?ve had the privilege and honor of covering this show since its inception. The experience has been nothing short of fantastic! Your success is directly attributed to the donation of generous sponsors and the volunteers over the last five years, giving of their time and talents. Thank you for your contributions. Last, but not least, a huge thank you to all the corps that have graced the field at this wonderful venue. You?re the reason we assemble yearly and experience this crazy activity we call ?drum corps?! Posted by DCP Publisher on Thursday, August 12th, 2010. Filed under DCW On-Line.